Selenite is a hydrous calcium sulfate mineral. It’s is a form of gypsum and is called Selenite if it is relatively clear and well formed. Selenite is closely related to fibrous gypsum, also known as Satin Spar, and the massive, fine-grained form known as Alabaster. It’s crystals are typically tabular, with striations running along the length. Selenite is formed as an evaporate in clay beds and around hot springs. Enhydro crystals containing inclusions of water and gas bubbles are found relatively frequently. Selenite can be colourless, grey, white, green or golden brown. Selenite is found in many countries, including Australia, Greece, Mexico and the USA. 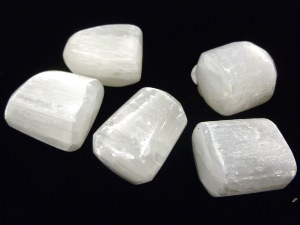 The best known and most popular Selenite crystals for metaphysical use are the long, clear crystals from Mexico. Spiritually Selenite’s energy is said to clear etheric blockages and debris, allowing for a freer flow of energy through the higher chakras. It is considered to aid in overcoming stagnation and prevent one from succumbing to the illusions of security’ and ‘comfort’. This mineral is said to provide for clarity of the mind, expanding ones awareness of the self and of ones surroundings. Selenite (Small) tumbled to a smooth finish, an ideal pocket size stone, small enough to carry around with you. Tumble Stones can also be placed around the home for their energies or can just be nice decorative items. Selenite crystal gemstones of varying sizes selected specially for your order.